A tuple is a combination of members from different dimensions. Each tuple has a single value (possibly null). This query returns a set of nine tuples. For example, the first tuple is a combination of Cedar Falls (from the City dimension) and %COUNT (from the Measures dimension). Where member_expr1, member_expr2, member_expr3, and so on are member expressions. In other implementations of MDX, each of these member expressions must be associated with a different dimension. This means that a tuple cannot include more than one member from the same dimension. In InterSystems MDX, a tuple expression can include more than one member expression from the same dimension. In most cases, the result is null, because in most cases, a record belongs to only one member. However, in InterSystems IRIS Business Intelligence, a level can be based on a list value, which means that a given record can belong to multiple members. For example, the tuple (allerd.soy,allerd.wheat) represents all patients who are allergic to both soy and wheat. If the tuple expression refers to each dimension in the cube, the tuple is fully qualified. A fully qualified tuple refers to a very small number of records and is too granular to be commonly used. If the tuple expression does not refer to each dimension in the cube, the tuple is partially qualified. A partially qualified tuple can be very useful, especially when used to filter the data used by the query. The expression (colord.red) is a tuple expression uses the Red member of the ColorD dimension. The expression colord.red is a member expression that refers to the Red member of the ColorD dimension. Each expression accesses only the patients whose favorite color is red. Every tuple has a value (which might be null). The system finds the rows in the fact table that correspond to all the non-measure members used in the tuple expression. If the tuple expression includes a specific measure, the system finds the value of that measure for each relevant row of the fact table. If the tuple expression does not include a specific measure, the system uses the default measure (typically, %COUNT). The system aggregates those values together, using the aggregation function specified for the measure. To determine the value of this tuple, the system finds all the patients in the fact table that belong to the 32006 ZIP code, and whose favorite color is red, and who are allergic to dairy products. The system then accesses the values for the Test Score measure for those patients and averages those values. To determine the value of this tuple, the system counts the patients who are allergic to both soy and to wheat. 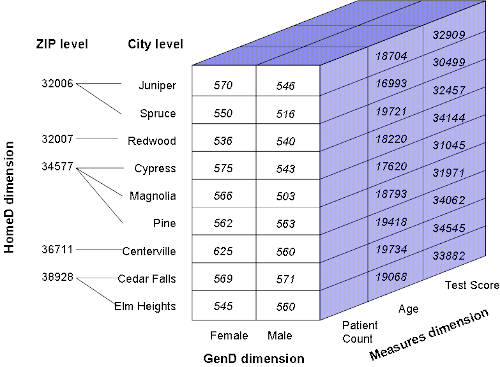 To determine the value of this tuple, the system counts the patients whose home city is Juniper and whose home city is Centerville. The value of this tuple is null, because each patient has one home city. There are 4 patients who are allergic to both soy and wheat. There are no patients with two home cities. A cube is an n-dimensional structure that contains one axis (or edge) for each dimension. The cells of this cube are tuples. An MDX query retrieves specific tuples from the cube. It is useful to visualize this cube, at least in simple cases. The DemoMDX cube has 10 dimensions (including the Measures dimension). For the sake of simplicity, the following figure shows three of those dimensions (HomeD, GenD, and Measures). Note that only three measures are actually shown. Each axis of the cube is divided into segments, with one segment for each of the lowest-level members of the corresponding dimension. For the HomeD axis, these segments are the members of the City level. Each cell in the cube is a fully qualified tuple. Each tuple has a value, as shown in the figure. For this query, the system finds the relevant tuples in the cube and obtains their values. For example, the first tuple is (homed. [cedar falls],gend.female,measures.[%COUNT]). The value of this tuple is 569. 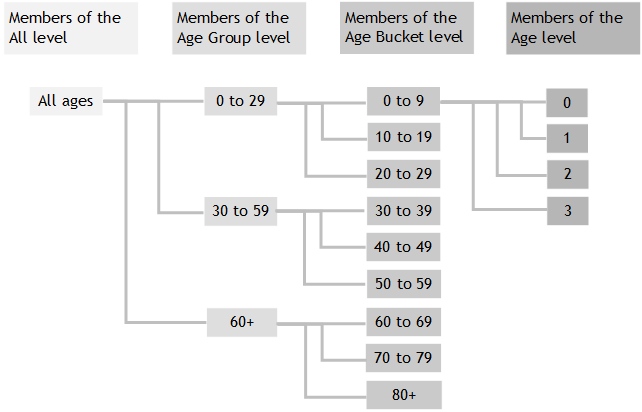 Each measure that is aggregated by addition (such as Age) is contained directly in the cube. For other measures, MDX uses values from the cube and aggregates them as specified in the measure definition. In this example, the second tuple is (homed. [cedar falls],gend.male,measures. [avg age]). To obtain this value, MDX divides the value of (homed. [cedar falls],gend.male,measures. [age]) by the value of (homed. [cedar falls],gend.male,measures. [%COUNT])  19734 divided by 571 is 34.56, as shown in the preceding results. For now, we consider only dimensions that contain a single hierarchy. For any dimension, only the lowest level is represented directly on the corresponding cube axis. Notice that the HomeD axis includes only the leaf members of this dimension  that is, only the members of its lowest level. The higher levels consist of combinations of lower members. For example, each member of the ZIP level consists of one or more members of the City dimension. For this query, the system finds the relevant tuples of the cube and obtains their values. These tuples have the values 570 and 550, respectively. 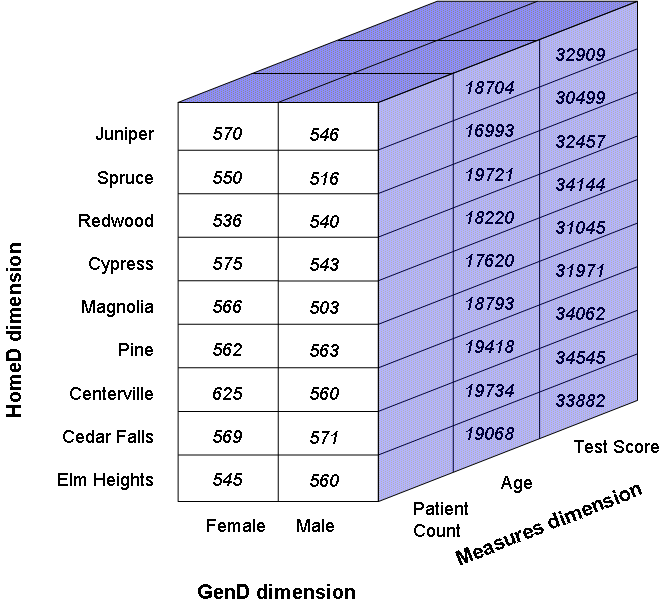 The %COUNT measure is aggregated by adding, so the value for (homed.,gend.female,measures. [%COUNT]) is 1120. A dimension can have multiple hierarchies. For a dimension that includes multiple hierarchies, the corresponding axis of the cube contains one segment for each member of the lowest level in each hierarchy. The Sales Year level. For example, a members of this level is 1990. The Sales Period level. For example, a members of this level is Jan1990. The Sales Date level. For example, a members of this level is Jan 3 1990. The other hierarchy contains only one level. When a query uses, for example, the Sales Quarter level, the system uses the appropriate part of this axis and accesses the requested tuples.